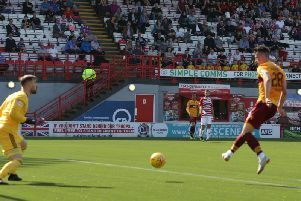 Motherwell ace Richard Tait is praying that he and his team-mates can produce a career crowning achievement by winning the Betfred Cup next month. Tait helped ’Well to a stunning 2-0 victory over Rangers at Hampden Park on Sunday to set up a final clash against reigning treble holders Celtic in the final on Sunday, November 26. If the Steelmen are to succeed, they’ll have to topple a side currently on an incredible 60-game unbeaten run. The 27-year-old former Grimsby Town ace said: “It would be massive for us to win this and when we were in the warm-up area before the game we were chatting about how it’s a major trophy and it would be great to get to the final. “I want to win stuff and if you look back on your career when it’s finished and you’ve won a major trophy you’d be happy with that. “When you’re playing a cup competition the aim is always to get to the final and win it but it’s almost a pipe dream at the early stages of the competition. “But we’re here now and we can crack on. I think everyone is gunning to be the team who stops the run Celtic are on. “But as much we enjoyed the victory we were back at it again on Monday and focusing on Wednesday. If Motherwell are to topple Celts then they’ll surely rely heavily on top scorer Louis Moult, whose two goals put Rangers to the sword. “Louis is unbelievable and he’s massive for our team,” added Galashiels-born utility man Tait. “But I don’t think he’d be the player he is without Ryan Bowman and it’s a partnership. “Moulty knows where the net is and I was right behind the second one and I thought ‘that’s quite far out’ then he’s just lobbed the keeper. “He’s fantastic and a real asset to the club and I hope he can go from strength to strength and see where he goes from there. “I was doing the cool down and Moulty said: ‘If you could bottle that feeling you would be a billionaire’. “That’s it, I’m just on top of the world at the minute. Yet ’Well utility man Tait was honest enough to admit that Rangers had bossed the early stages of Sunday’s semi-final at Hampden. “I think it was 100 miles an hour the first half for us,” he said. “We couldn’t really get out or we needed to buy an extra pass before we put the ball forward. “It was going too long, too early but we came out second half and got a goal from a setpiece. We work hard on them so to get goals from them is really rewarding. “That settled us into the game a little bit and I think towards the end of the game we got the ball down in little spells and started to knock it about. “Everyone’s absolutely delighted that we battled hard and everyone’s together in that dressing room. “It’s great to get to the final. “I think everyone can see today we battled really hard to do that and it paid off. “I think our fitness is a massive part of our game and I think that helps us build into the game the longer the game goes on. “So I think we all knew as a team if we stayed in the game for as long as we could we’d probably come out on top. “I think we made it a physical game. You could see at the end that they didn’t like it, they didn’t fancy it.